Feeling sad and depressed because I haven't slept out in wilderness for a few weeks, went to town in the search of fulfilling my hiker chi. Overhearing a conversation at the local outdoor gossip spot, a trail friend that I had originally met on the Skyline Primitive Trail years ago was soloing up into the snowy alpine as a night hike. I took a chance and asked him if he wouldn't mind a hiking partner, because I was desperately seeking/dieing to get out. 24 hours later we were night hiking in knee deep snow. We had a mixed bag of weather with rain and wind moving in overnight. Clouds never lifted enough for the breathtaking Bailey Range views, but it was good to be sleeping in the wild once again. This had the most cougar activity I've ever seen in one area in the Park. Fresh cat prints everywhere as I zipped up my sleeping bag for bed. Literally pitching my shelter on a set of mom and young print from just before we arrived. 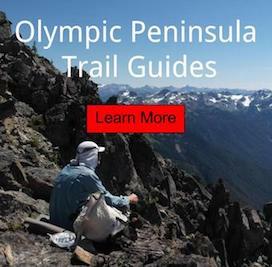 Exploring the Dodger Point lookout from camp. Decided to climb up to the old WWII Dodger Point Lookout. Cold rain all night. Knock - knock nobody is home. Headed back to which we came last night via headlamps. Knee deep white stuff. Ludden Peak hiding in the clouds. Familiar camp for some. This is where Oliver and I turned around last year, because of triple the snow pack. After dropping 5,000', we were back down into the Elwha River Valley and out of the snow. 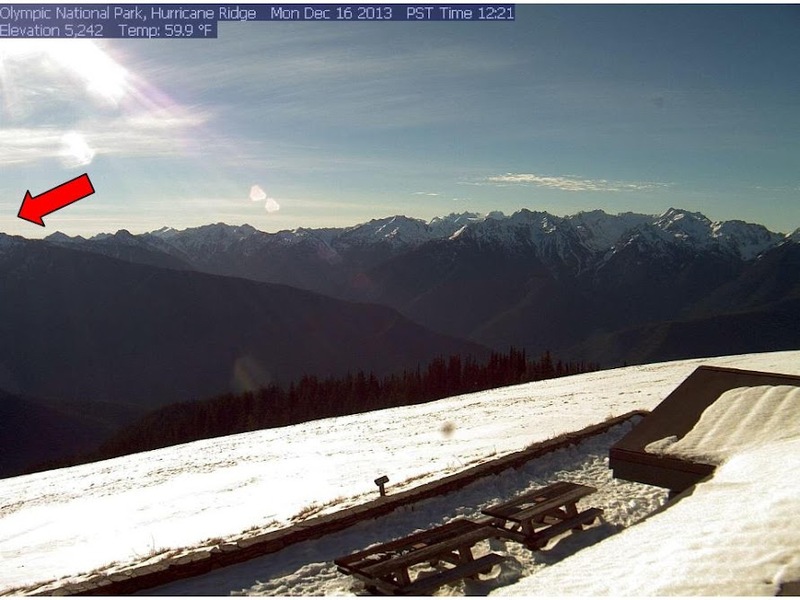 Dodger Point area, seen from the Hurricane Ridge Webcam. We seemed to of missed the weather. Revisited Dodger Point Lookout on a clear day, a few weeks later.